looking for Lecturer/ Assistant Professor Jobs are eligible for HP State Eligibility Test HPSET- 2017. Himachal Pradesh HPSET 2017 will be held in the month of February/March 2018. HPPSC has been released HPSET Notification on 08-November-2017. HPPSC will conducting this HPSET 2017 for the available 22 subjects. HPPSC Online application link applying for HPSET will be available from 09-November-2017 and will be closed on 27-November-2017. 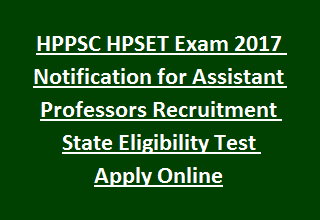 Applicants with Master’s Degree qualification can apply for this HPSET 2017 Exam using the HPPSC official web link @ http://hppsc.hp.gov.in/hppsc. Further details regarding HPPSC HPSET- 2017 Exam Notification dates, Exam Pattern, Qualifications, available subjects, Exam Centres and other details are mentioned below. Total available subjects in the streams of Science, Arts and Humanities Himachal Pradesh State Eligibility Test HPSET for Assistant Professors. Applicant must have qualified Master’s Degree in subject concerned. Candidates appearing for final year exams/ waiting for results are also eligible for applying HPPSC HPSET Exam-2017. For more qualification details, please see the HPPSC Notification. Dharamshala, Mandi, Kangra, Palampur, Shimla, Solan, Sunder Nagar. Exam centres will be changed depends on the number of candidates appearing for HP SET 2017. For OBC of Himachal Pradesh Rs.350/-. HPSET exam will be held for 350 marks, each question carries 2 marks. No Negative Marks for this HP State Eligibility Test- 2017. Himachal Pradesh SET Exam consists of 3 different papers (Objective Type). HPSET 2017 Exam Syllabus will be same as UGC NET. Paper 1: In this candidates skills in reasoning ability, divergent thinking, comprehension and general awareness. Paper 2 & Paper 3 Syllabus will be from concerned subject.